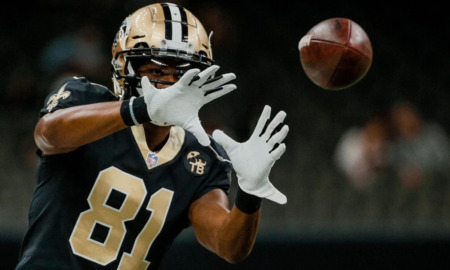 Cameron Meredith and the New Orleans Saints didn’t get the inaugural season they wanted. Meredith logged just 114 yards through six games before landing on injured reserve following a surgical procedure on his knee. Now the Saints are staring at a $6.4 million salary cap hit for Meredith, knowing they can save more than $3.7 million by releasing him. But the Saints know something else: Their receiving corps isn’t good enough to punt on Meredith so soon. Beyond Michael Thomas, no Saints receiver regularly threatened opposing game plans. Rookies Tre’Quan Smith and Keith Kirkwood had promising moments, sure, but quarterback Drew Brees struggled to connect with Ted Ginn Jr. after a terrific 2017 campaign. Austin Carr was talked up as a slot specialist and he notched as many catches as Meredith — in more than twice as many games. Tommylee Lewis was an afterthought forced into big moments due to injuries. Need more from Smith and Carr. Who knows on Kirkwood? Pick a position for Arnold. Then Ginn, Bryant, and Meredith: look great on paper if healthy, but the 25 combined catches might tell a truer story. Tommie Lee wouldn't be in the conversation if we didn't have these ^^ other ifs. Injuries. All season. Never could get momentum. PI doesn't help either. I'd be very surprised if Carr makes the final 53 for 2019. Completely invisible. I believe Simmie Cobb could leap frog him at camp. Chain movers and can create separation in crucial moments. Read (Nola.com) where Michael Thomas was targeted 147 times last season. The rest of the receivers ... 122 and only 79 catches. ...Read (Nola.com) where Michael Thomas was targeted 147 times last season. The rest of the receivers ... 122 and only 79 catches. Rugby Saint II and st thomas like this. Payton lost trust in Snead far too quickly.